When it comes to harvesting basil, anytime is a good time. You can begin picking the basil leaves consistently when the plant is 6 inches tall. It's usually best to harvest the leaves at the top of the plant first. Only pick a few leaves at a time off of each plant, depending on the plant's size. The larger the plant, the more leaves that can be harvested. The plant will continue to grow and produce more leaves. You need to leave enough foliage on the basil plants so that they can efficiently produce more leaves. A healthy basil plant will continue to produce leaves throughout the growing season, as long as you keep harvesting. Basil leaves are harvested by pinching them off of the stems with your fingers. Simply grab a leaf firmly and pluck it off the plant. The closer the plant is to blooming, the more flavorful the basil leaves will be. 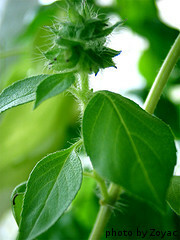 If you see a flower bud forming on your basil plant, it's the best time to harvest the leaves. You should also go ahead and pinch off the flower bud - this will help the plant to focus its energy into more leaf production. If you can keep the flowers from forming, more basil will be produced. At the first prediction of the first frost in fall, even a mild one, go ahead and harvest all of the remaining basil leaves. At this stage, you can go ahead and cut off the entire plant at ground level with a pair of garden shears. 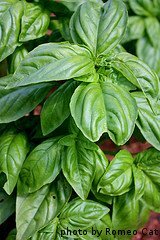 After harvesting basil, it can be dried, frozen or eaten fresh. To dry basil, remove the leaves from the stems. Put the leaves in a food dehydrator until they are completely dried out. They can then be chopped up and stored in an airtight bag at room temperature for up to 12 months. If you don't have a food dehydrator, you can hang the basil branches in a warm room. The leaves will dry out in 10-14 days. Basil can also be frozen. Place a single basil leaf in each segment of an ice cube tray. Fill the tray with water and freeze. Place the ice cubes in a plastic bag. When fresh basil is desired, thaw as many ice cubes as needed. Basil can also be kept fresh on your kitchen counter for several days. Simply place a cut stem with several leaves on it in a vase of water like you would a flower and pluck the leaves as needed. Now that you're done harvesting basil, it's time for some of our favorite basil recipes.